Fresh produce will be available from butchers, greengrocers and fishmongers offering a unique experience for visitors to the town centre, six days a week from 8am to 5pm. Traders are moving over from Scunthorpe Market to the new St John’s Market and they will be joined by new business ventures. Wendy Cooper from Pandora’s Box is a new trader at St John’s Market, she said: “I’m really looking forward to working in the market, which will be a great sense of community with other traders and the constant footfall with it being open plan in the units on both levels. It’s not just one shop where you are in and out one shop at a time. You can stroll through, sit and have a coffee, have a chat with your friends and something to eat. Richard Neilson from Bacon Charlies is moving over from Scunthorpe Market, he said: “By moving, there is a great opportunity to reach out to new and old customers, and give everyone a better environment. We’re going to be in a more central position and I think the parking is very good and convenient. The Food Court, located on the first floor will have a large communal area for eating, drinking and socialising. It will open six days a week with opening hours extended into the evening. Free Wi-Fi will be available in the new market and free public toilets, which will replace the existing public facilities at the bottom of the high street. “St John’s Market is really starting to take shape ready for opening on 22 March. With over 60 traders on board, it is going to be a real destination for shoppers and visitors. 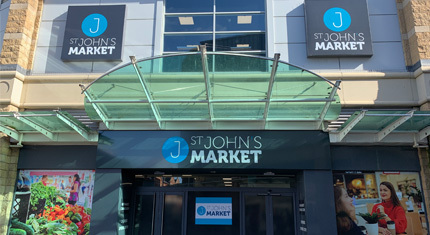 St John’s Market will help redefine the town centre and create new opportunities for traders and business start-ups. “We are pleased to announce that not only do we have traders moving over from Scunthorpe Market, we also have a number of new traders in the market and The Food Court. This is an exciting time for Scunthorpe town centre and the opening of the market will signify the direction we are going in to bring in more investment and boost the economy. “The new market is a huge investment in Scunthorpe town centre and forms part of wider regeneration plans to transform the area. Sat in a prominent position in the town centre, it will attract more people into the market. Visitors will have a completely different experience to what they are used to from their local market.